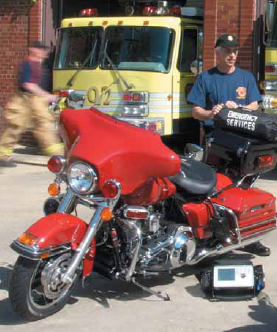 As a tribute to firefighters after the Sept. 11 terrorist attacks on the U.S., Harley-Davidson introduced the Firefighter Special Edition motorcycle in 2002. They have extended the bike’s availability into the 2009 model year. Harley produced a motorcycle designed as a salute to firefighters, many of whom risked their lives aiding victims of the attacks on the World Trade Center in New York City and the Pentagon in Washington, D.C. The motorcycle’s design is similar to those manufactured by Harley-Davidson for law enforcement officers, which have been available since 1987. The Firefighter Special Edition is made in two versions. 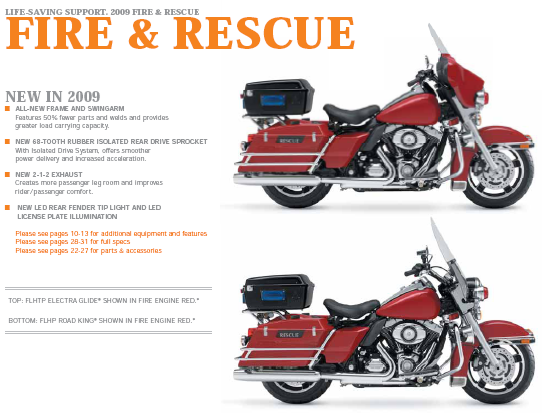 The Electra Glide and Road King are both available in Fire Engine Red. The Sept. 1, 1908 issue of Motorcycle Illustrated offers the earliest documented police department use of a Harley-Davidson motorcycle, in Detroit, Michigan. I wanted to provide a shout out and thank you on this day of remembrance. Photo courtsey of HD web site.